It’s where sand drifts silently creep onto the roads and golden dunes punctuate the brush that covers much of the undulating landscape. It’s also where desert camps offer you a chance to sleep under a canopy of stars in the open embrace of the Thar. There’s another reason Jaisalmer is called the Golden City – for the yellow stone used to build the abodes of both kings and commoners. And, every evening, when the sun glints off the stone in the falling light of dusk, the city is plated in pure gold. 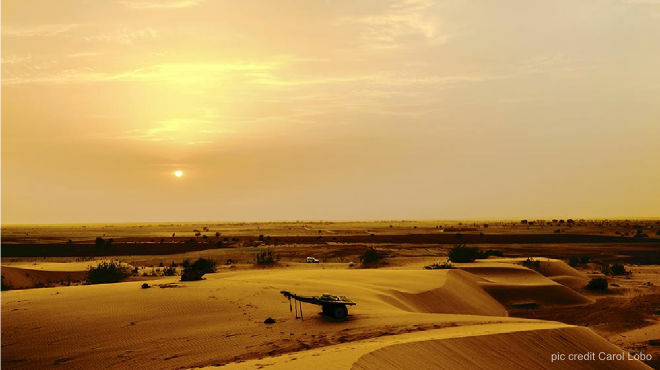 The town is small and there are two compelling reasons to visit – the living fort called Sonar Quila, which dominates the town; and sand dunes, camel safaris and desert camps, which dominate the dreams of travellers to the desert state of Rajasthan.